PopDrop makes Popovers, Tooltips, Mega Menus, Dropdowns and Modal Dialogs that are simple and stylish. Make your own menus using any stacks that you like. There is also TipList mode that allows you define tooltips for your whole site in one stack. It works in any theme but also has special integrations for ButtonPlus2* and MagicGellan2. PopDrop is the easiest way to display extra information, make menus and dialogs using just about any stack that you like. Originally, PopDrop started out life as a dropdown child stack for ButtonPlus2 but it became apparent that it was so useful that it should be a standalone stack as well. You can see simple examples of PopDrop all over this site, it is how the dropdown menus are made. 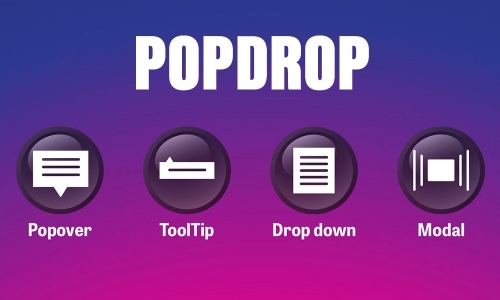 PopDrop can do so much more besides as well. An easy to use Mega menu stack has eluded us for a long time. Now PopDrop allows mega menus to be attached to anything that you can add a link to. DropPop does not stop there though. You can make Dropdown menus, popovers, modals and tool tips. Tooltips have traditionally been a pain to add. Various solutions have involved adding the Tip text to link attributes and other convoluted means. PopDrop allows you to make a single tooltip containing any stacks that you like but the real power comes with the TipList mode. Put PopDrop into TipList mode and you can enter all the tips for a page into just that one stack. If you make it into a Stacks Partial, you can then enter all the tips for your entire site. TipList has a convenient helper mode so that you can see your tips and their identifying names floating in edit mode. As you scroll around the page and add links to text, the TipList is always there at hand for reference. There is a short video of this in action on the demo site. I hope you enjoy PopDrop and don't forget that ButtonPlus2 is coming very soon. Foundation users will then get some quite unique options for making menus and other great UI elements.